The opening day of the return of Slam Dunk to the Beach is in the books. The second session began on Saturday with Saints Neumann And Goretti beating Gill St. Bernard’s 59-50, then continued when Sunrise Christian (KS) routed Mount St. Joseph (MD), 64-39, and wrapped up with Sanford (DE) running away from Salesianum (DE) 64-44. 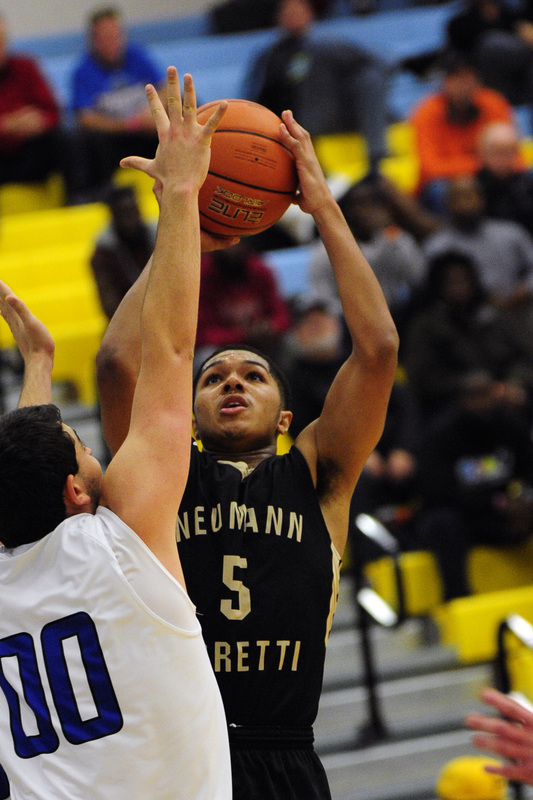 Neumann-Goretti rebounded from a rough opening period in game one. The Saints were down 20-12 after eight minutes and saw their deficit grow as large as 12 two minutes into the second quarter. But Carl Arrigale‘s team kept working, pulling to within one by the break. Then after an even third period, Neumann-Goretti’s guard depth began to pay off. The Saints out-scored Gill St. Bernard’s 19-9 over the final eight minutes, with all of the points coming from the back court. Young Quade Green was the best of the bunch on Saturday. The sophomore had seven of his game-high 27 points in the fourth quarter. He connected from inside (four layups), outside (2-of-3 from long range) and at the foul line (7-of-8). Green also made his presence felt defensively, where he added four steals and even on the glass as he pulled down six boards. Conversely, Gill St. Bernard’s was playing without its best player. Tyus Battle missed his fourth consecutive game with an ailing foot. Battle is the 14th-ranked junior in the country according to ESPN, with offers already from Kentucky, Duke, Connecticut, Louisville and others. Jonas Stakilunas tried to fill the crater-sized void with 15 points and nine rebounds, but Battle’s absence was simply too much to overcome. ” It changes the dynamic obviously,” said Knights head coach Mergin Sina. “He draws a lot of attention. So, when that happens it opens things up for the rest of the players. So obviously it’s very difficult that we’re playing without him, but we have to play with what we have. The second game featured another bounce back from a subpar first quarter. Sunrise Christian gave its entire team a week off for Christmas. Since the players hail from all over the country they were a tad late reconvening for this tournament. Head coach Kyle Lindsted said the Buffaloes did not reach their team hotel until 3:30 a.m. Saturday morning. And struggle they did, as Mount St. Joseph led 15-9 after one quarter. The Gaels maintained the advantage until the final minute of the second period, when Sunrise Christian finally found their bearings. And what impressive bearings they were, as the Buffaloes unleashed a 32-2 run that spanned the final 3:11 of the first half and the initial 6:52 of the third quarter. Roman Young was the catalyst on Saturday. The first-year starter at point guard looked in total command on his way to 10 points, five assists and only one turnover. Roosevelt Smart led all scorers with 15 points, while Dainan Swoope and C.J. Keyser added 12 points each. Mount St. Joseph did not have a single player score in double figures and made just one of its 10 three-point tries collectively. The nightcap was close for a half, but a big third quarter and an even bigger start to the fourth period turned this rivalry game into a laugher for Sanford. The Warriors held Donte DiVincenzo, who has committed to play at Villanova next season, to just 11 points on 3-of-17 shooting. Sanford head coach Stan Waterman was pleased with how his defense attacked the best player in the state of Delaware. Sallies head coach Brendan Haley conceded it was a rough night for his star player, but said it was far from all DiVincenzo’s fault. Sanford used its athleticism on offense to wear down the Sals, out-scoring Salesianum by 12 points after the break. Slam Dunk to the Beach continues on Sunday with six more games, split up into two sessions. The first session begins at 12 p.m. St. George’s (DE) takes on Mount St. Joseph (MD). Two teams make their tournament debut at 1:30 p.m. when The Haverford School (PA) battles Roselle Catholic (NJ). The opening session concludes at 3 p.m. when Saints Neumann And Goretti (PA) battles Sanford (DE). “I think Dante was sensing that we were having trouble with some of the stuff we want to do offensively and there were too many times tonight where he tried to do a little bit too much and this is a good team that’s not going to back off and they’re going to keep bringing extra bodies. He’s got to give those other guys a chance, but they’ve got to make plays too. It’s on both ends. It’s on Dante a little bit to find his teammates when he draws that much attention, but then guys have to make shots when he does find them.